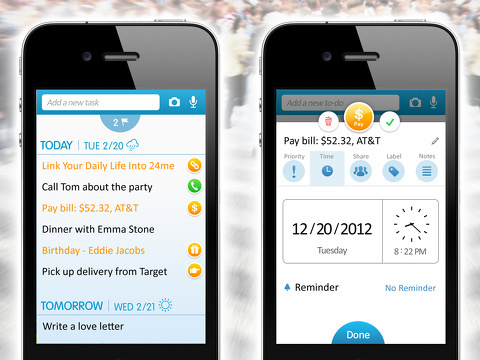 24me is an iPhone productivity app that helps you manage your to-do lists, phone calls, tasks, bills, and birthdays. 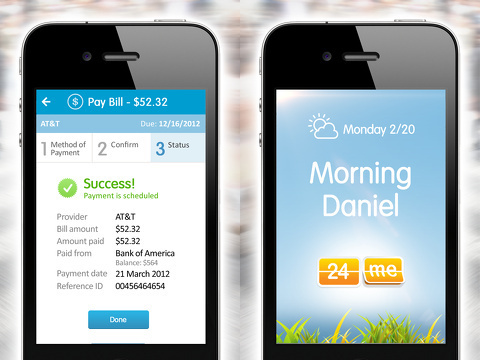 Filled with syncs, authorizations, and a few exceptional tools, 24me is moving in a solid direction to streamline all of life’s details. You can establish a 24me account with a Facebook authorization or an email log-in. The Facebook authorization does ask to post on your behalf, so you may want to adjust the privacy settings. The Facebook authorization automatically brings your friends’ birthdays into the account, so you can post a Facebook message directly from 24me or send a gift card through GiftRocket. As with productivity iPhone apps, there is some time involved to authorize and sync accounts to maximize the features. For 24me, each step to set up and use its tools is an item on today’s to-do list. You link financial acounts and utility providers to streamline the process of paying bills. Currently, the list of banks and utility providers includes several national institutions and regional operators in the largest metropolitan areas in the United States. You can add these bills to to-do lists, so they show up in your daily task list. You can get folks to run your errands by requesting bids through Taskrabbit.com. These tools require an additional authorization to sync your Taskrabbit.com account with 24me. There is a quick tutorial of the to-do list tools, as well as navigation hints to let you know the 24me iPhone app settings are accessed by a swipe down the screen. Once you power through the set-up process, the to-do list tools are brilliant. There is a field at the top of the screen to type a task, shoot a photo, or speak. As you add a new task, you can build in due dates, reminders, notes, photos, labels, voice notes, and sharing with simple, intuitive interface. Under the task, there are five icons: priority, time, share, label, and notes. You switch between these icons with touches on the screen. Each icon has tools and functions to complement the category. For time, you can set a due date and reminders. For share, you can send an email from your contacts. You can quickly add a label. However, the notes icon is the star. You can add a text note or a voice note, but you can also add a photo note. If you can’t remember your printer’s string of letters and numbers to help you buy new ink cartridges, just snap a photo. When you have added all of the appropriate details, you tap done. It is added to your list. When you complete it, you swipe horizontally to delete it. An especially cool feature is the reminder to make a call. When you type the task, you type “call” at the beginning. You then select from your contacts who you will call. The task then shows up with a call icon in the list. With two touches, you are dialing the contact. The 24me iPhone app does have a few items to finesse. You can label your tasks, but you cannot sort or search for them from the home screen. Currently, you must access your settings and set the tasks to sort by label instead of time. The top menu bar could accommodate that feature without adding visual clutter. The set-up process is laborious, and, perhaps, it would be better to lead people screen by screen through it. Finally, the visual presence is stale. The colors seem faded and unsophisticated. These minor tweaks would engage and enhance the experience. The 24me iPhone app’s to-do list tools and functions are top-notch. But, this one great idea and its successful execution is trapped in a wonky package. AppSafari review of 24me was written by Jenni Ward on November 15th, 2012 and categorized under App Store, Calendar, Free, Notes, Photos, Productivity, Utilities. Page viewed 5302 times, 3 so far today. Need help on using these apps? Please read the Help Page.